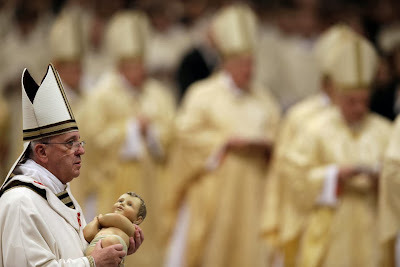 Nine months after his election, Pope Francis presided at his first Christmas Night Mass at 9.30pm Rome time (3.30pm ET/12.30 PT) on the Eve. In the other half of the traditional Christmas with the Pope, Francis will give his Urbi et Orbi greeting from the central balcony of St Peter's at Roman Noon on the Day itself. That'll run here too at the designated hour... once it's over, though, we're going dark for the Octave to enjoy the gift of these days with family and friends. Hopefully you're in for no less over the week to come, and even more. Again, to one and all, may every blessing and all the light of the Lord's Coming be yours on this Holy Night and throughout the New Year. May we know love, joy, peace, and especially where it's needed most, may we always know hope. Buon Natale a tutti – Merry Christmas!